A site that caught the eyes of millions of travelers on their way to the Grand Canyon has closed its doors after nearly a half-century in business. Bedrock City, located south of the Canyon's South Rim on State Route 64, was a Flintstones-themed roadside attraction featuring kids activities, a restaurant and a gift shop. As KJZZ reported last week, Bedrock City quietly shut down the weekend of January 26 after being up for sale for several years. A new owner was set to take over the property, and he told The Arizona Republic that it will become Raptor Ranch, which will feature birds of prey on display and in performances. The property dates to 1972, when the Speckels family purchased it. 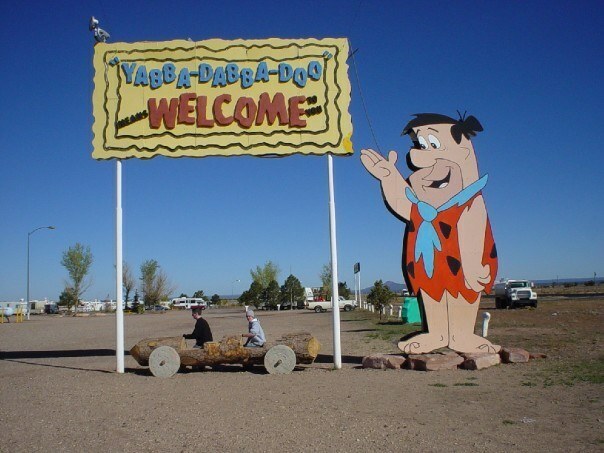 A member of that family worked in the original Bedrock City theme park in South Dakota before building the Arizona version, KJZZ reported. That site closed in 2015. It's not exactly the Stone Age, but if you're looking for a little history on your way to the Canyon, check out the Moqui Stage Station scenic drive, which offers a look at an 1890s stagecoach route from Flagstaff to the natural wonder.